The photographs below were taken on 5 July 1923. 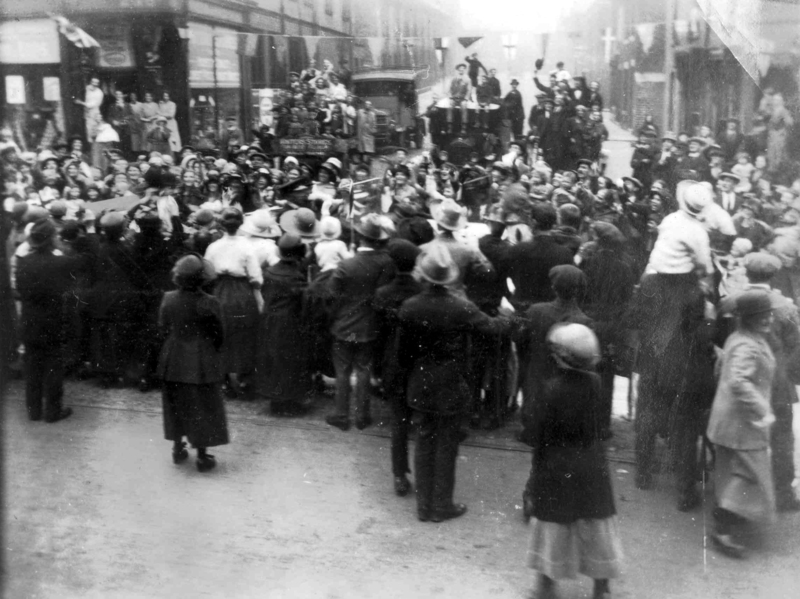 The occasion was a visit to Newcastle by the Prince of Wales, later to be crowned King Edward VIII. The Prince’s visit to the North East lasted 3 days. 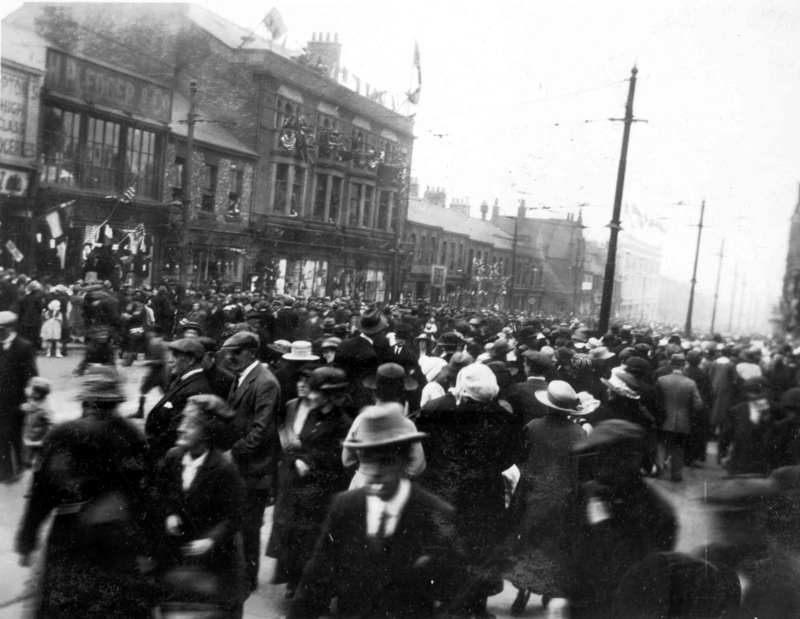 Amongst his engagements in Newcastle itself were visits to the Royal Agricultural Show, which that year was held on the Town Moor, and to St James’ Park, St Thomas’ Church and Walker Naval Yard. 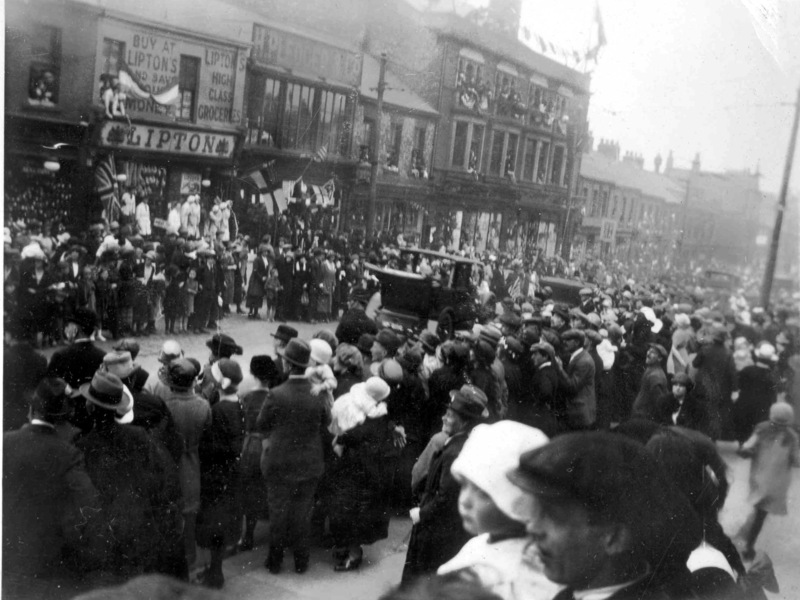 On the afternoon of Thursday 5th he went to Parsons in Heaton and returned to town along Shields Road. It was a very hot day with the temperature reported to have reached 86 Fahrenheit (30 degrees Celsius) in the shade, although you might not know from the clothes the crowd are wearing. The pictures were taken by Edgar Couzens, a keen amateur photographer, who at that time was the proprietor of a butcher’s shop at 185 Shields Road. 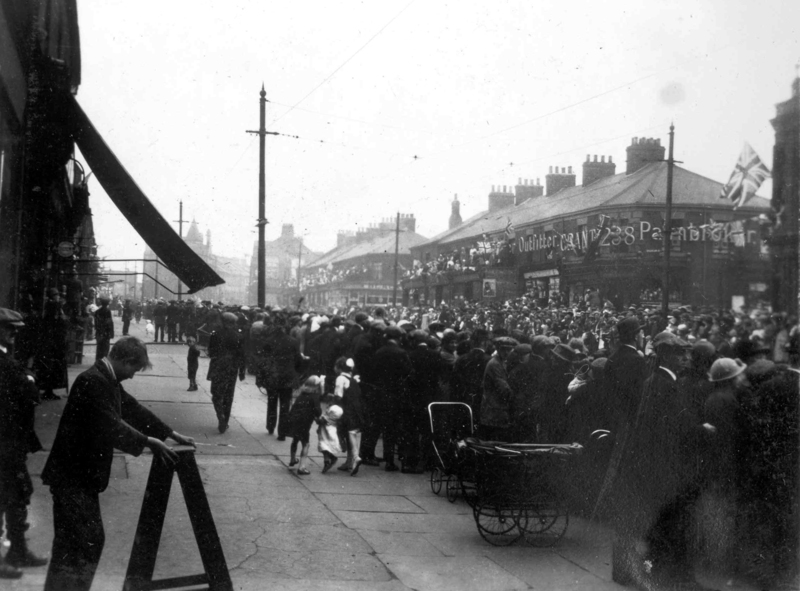 He set up his tripod to the side of his shop, which was just East of Heaton Road. Thank you to Mike Couzens, Edgar’s grandson for permission to publish them for the first time. Lipton’s, the most prominent shop in the last photo, is now Ladbrokes Bookmakers. Next door (in premises now also part of Ladbrokes) was Pledger’s drapery which also had the larger shop two doors down, now Nobles Amusements. Between them was squeezed Bookless, a fruiterer, now the Cooperative Funeral Store. The Raby Hotel was, as now, further along the road to the right. While Lipton’s was a national chain which had its beginnings in Glasgow, Pledger’s was a local company. It had had a presence on Shields Road since the 1890s, firstly at number 214 as Flintoft and Pledger. But by 1900 it was solely Pledger’s and had expanded into a second shop. Herbert Pledger senior was born in Cambridgeshire, the son of a ‘bootmaker and publican’. He was one of at least 10 children. By 1891 at the age of 22, he was a draper’s assistant in Saffron Walden, Essex, and lodging with his employer. Within a few years he had moved North and entered into a business partnership on Shields Road. Soon he was to have his own firm. We can track Herbert’s success by his various Heaton addresses. In 1895, he lodged at 29 Kingsley Place. By 1900, he was married, with a young son, and was the householder at 106 Cardigan Terrace. In 1911 he, his Gateshead-born wife Annie and their growing family lived at 20 Simonside Terrace and by the time this photo was taken in 1923, they lived at the much grander Graceville, overlooking the park on Heaton Road. He died in 1929 with an estate worth over £80,000, a significant fortune then. His sons, another Herbert and William followed him into the drapery business and Pledger’s was a well known landmark on Shields Road until the mid-1960s. It was succeeded by Waring and Gillow, a furniture store. The photograph here shows CA Parsons employees who had fought in World War 1 forming a guard of honour for the prince earlier in the day. This entry was posted in Research and tagged Bookless, Cardigan Terrace, draper, Edgar Couzens, fruiterer, grocer, Heaton Road, Kingsley Place, Lipton's, Pledger, Prince of Wales, Raby Hotel, royal visit, Shields Road, Simonside Terrace on July 3, 2013 by oldheaton.